One of the most precious things you can find as a writer is the opportunity to improve. Hard work and practice helps a lot, but there are times when you need that little bit of extra help, and working with an editor can present such an opportunity. 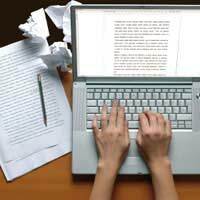 At its best, editing is a two way process in which you can communicate closely with your editor to better understand the strengths and flaws of your writing. Your editor can give you tips on how you might improve and you can return later for advice on how successfully you've implemented them. As a two way process, effective editing requires hard work on both sides. If you're serious about improving your writing, you too need to be able to dedicate yourself to analysing the minutiae of your work and making long-term changes. Spelling and Grammar - many writers make the same mistakes over and over again without realising it, and automatic checkers can't catch them all. Working with an editor also gives you the opportunity to ask questions about aspects of grammar which you've never been sure of. Construction - a good editor will help you think about how your articles, book chapters etc. are arranged, so that you can learn more effective ways of building up a story or an argument. Tailoring - your editor will usually be required to tailor your work for a specific market. Pay close attention, as learning to think about your work in this way will make it easier for you to get and keep jobs. Confidence - Knowing that you can improve and winning the approval of a strict editor can help you to feel more confident about your work and better prepared for taking on challenges in your career. Where you receive the most help will depend on where your weaknesses lie and on the particular strengths of your editor. Good editors take a degree of personal interest in their writers and learn to anticipate their difficulties. To work successfully with an editor, you'll have to acknowledge that even your best work may be flawed. You'll also have to understand that people see things differently and that, as far as a specific job is concerned, you editor's view will almost always be the correct one. In a very few cases editors make mistakes, suggesting inappropriate changes because they've misunderstood what you're saying. However if this happens you have to ask yourself if you needed to be clearer about what you were saying in the first place. If your editor can't understand you, what chance do your readers have? Your editor is there to help you improve your work, so don't be afraid to ask for advice if you're not sure how to do something. To get the most out of your working relationship, you should try to be proactive. Professional writing is a continual learning process and there's no shame in not being perfect - generally it's those writers who think they are who need the most help. Redrafting can be a cumbersome and tedious process, not to mention a disheartening one, but it's something you'll have to learn to handle if you're to be successful in your writing career. Many employers will only permit you to redraft a piece once before rejecting it if it still doesn't suit their needs. Try not to be sentimental when redrafting. Sometimes it's easier to completely excise a portion of text and write it over again than to make small changes as you go through it. However it's important to work back through what you've written and make sure that your redrafting hasn't created inconsistencies. Working with an editor can be a difficult process but it's important to keep focusing on its positive potential. Ultimately, you undertake writing in order to be read, and your editor is there to help you make that happen.